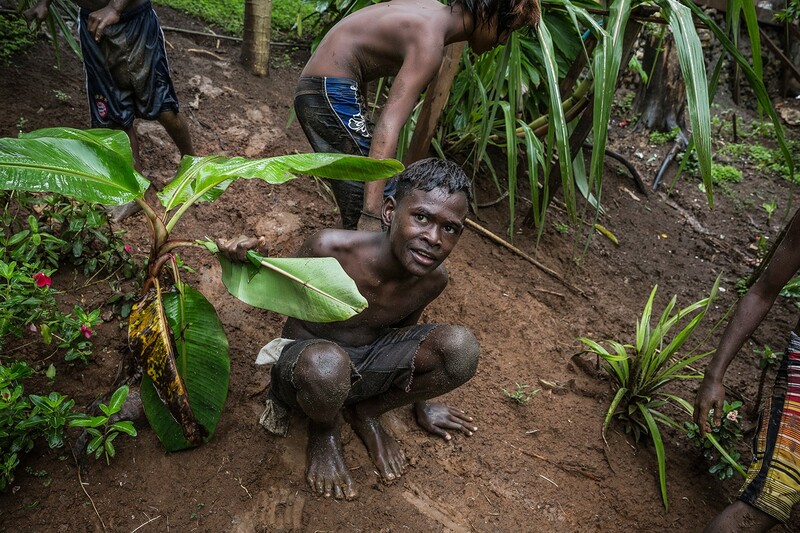 Vatu, 11, sitting in the mud while playing with his friends in the outskirts of Honiara city. 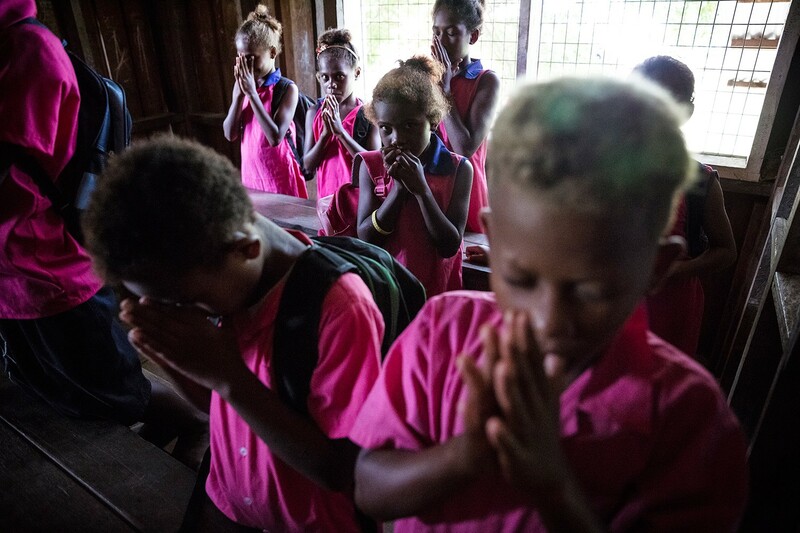 Grade 2 students of Ilia Primary School praying in their classroom before the end of their lesson. Hamish Lindsay is UNICEF New Zealand’s Programmes Manager. He explains how the work he helps coordinate ensures a more prosperous future for kids growing up in the Solomon Islands. I love going to the Solomons. For me it’s the people. It’s a beautiful place, but the people are very warm and welcoming, and easy to talk to and get along with. The communities are very vibrant, colourful, and exciting. It’s quite hot and humid, so compared to my primary school experiences in Scotland — which I still enjoyed — quite different indeed. It’s a beautiful place, but the people are very warm and welcoming, and easy to talk to and get along with. Whenever we visit, more often than not there’s some form of welcoming party. Sometimes it’s a very formal welcome ceremony, which can take one or two hours, with speeches and presentations. Sometimes it’s a sumptuous banquet of seafood, yams, cassava, and local fruits like passionfruit and pineapple. 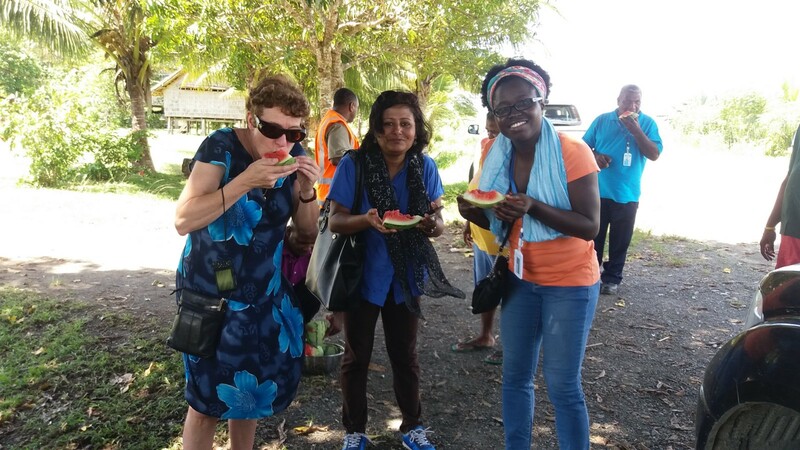 The UNICEF team being welcomed with some locally grown watermelon — delicious! Quite often at schools you’ll get a group of children singing a song or two — it’s brilliant. It always brings a smile to my face to see the children — they love to sing and it creates a really nice atmosphere. 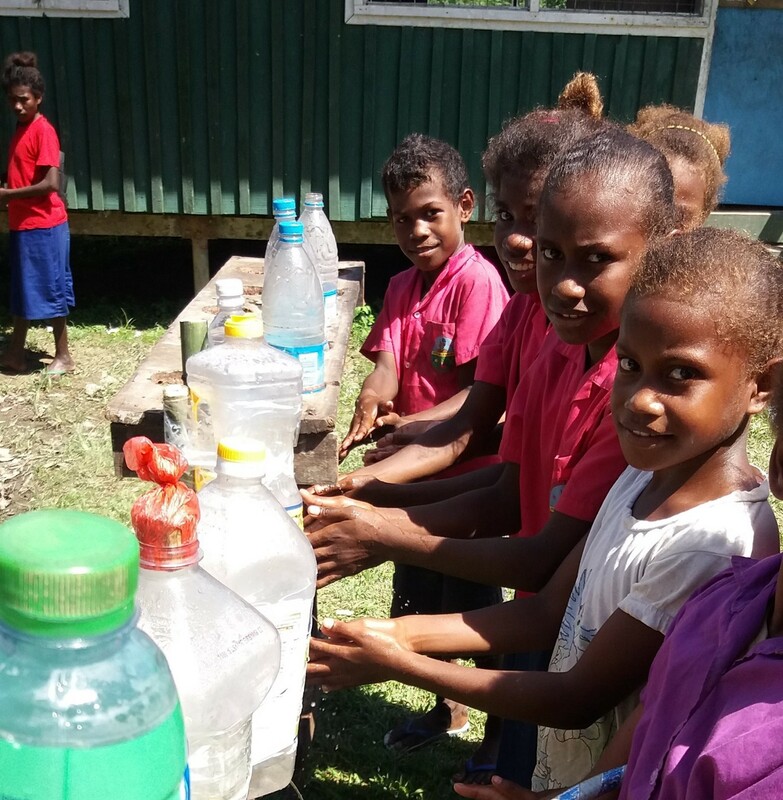 At the moment we’re working in the Solomons with the Ministry of Education, putting water, hygiene and sanitation into 42 schools on the main island, Guadalcanal. We’re doing that alongside Environmental Science and Research (ESR) to create guidelines that’ll help other schools to install new systems. We’re also very lucky to get support from the NZ Aid Programme, who are funding 80% of this project. At some schools one set of bushes is allocated to boys, and another allocated to girls. The toilet facilities available to children in the Solomons vary wildly. Of the four schools we visited — two had no toilets at all, and two had some form of toilets, although some were quite old and not functioning. 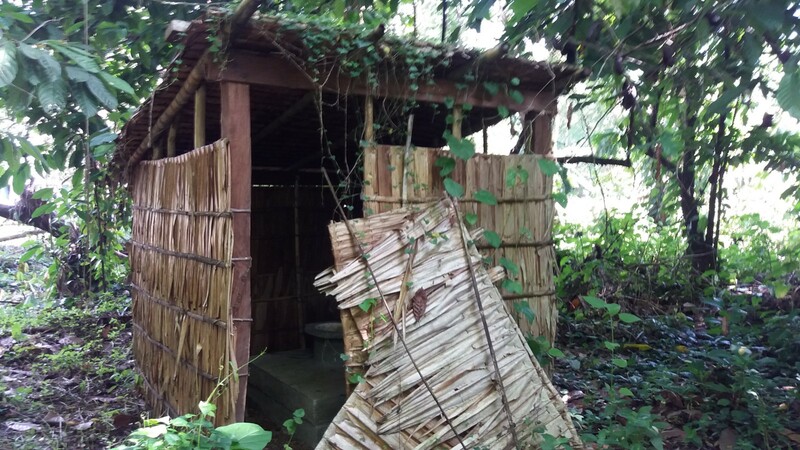 One of the toilets at a school that’s fallen into disrepair. If kids don’t have toilets, their only option is go to the bushes. At some schools one set of bushes is even allocated to boys, and another allocated to girls. As you can imagine, going to the toilet in the bushes without any water, there’s no handwashing going on, there’s also faeces in the bushes. And when you have very young kids running around and playing, it’s not a great place. There’s a much higher chance of children getting ill, which means time off school with things like diarrhoea and potentially worse diseases. From my experience it’s not unusual for a lot of children in a community to be sick at any one time. Recently, in Vanuatu, we asked one community how many children had had diarrhoea recently. Out of about 200 children, up to twenty had been sick just in the last two weeks. A lot of children in these remote areas end up walking one or two hours each way just to get to and from school. 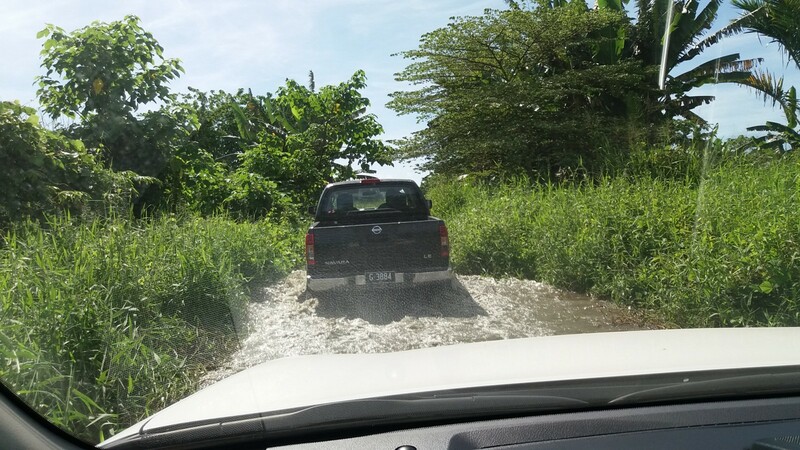 The schools we’re working with are all within three or four hours of the capital, Honiara, but once you get off the main road it’s pretty rough. We had 4WDs and there’d just been a big rain, so we were literally driving through 3 feet of water to get to some of these communities. The journey to each of the villages isn’t easy — wet, muddy and difficult. It’s really thick bush - on one visit we basically saw nothing for the last half an hour, it was so thick. A lot of children in these remote areas end up walking one or two hours each way just to get to and from school. We visited one school that’s in the process of relocating away from the river. It had burst its banks and flooded, so they’re moving the whole school, piece by piece, to a location about 1km away from the riverbank. 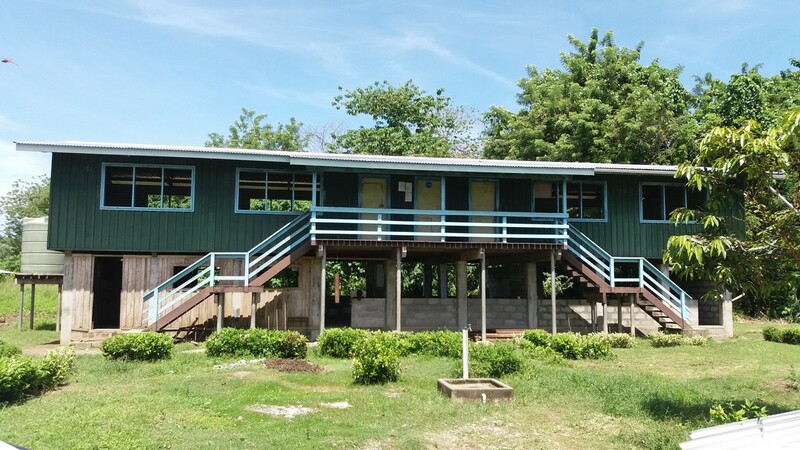 In a lot of communities the school is used as evacuation centre. If there’s a big cyclone and houses are destroyed, people will automatically move into the school building. So, besides providing education to their children, you can see how important schools are to the community. Schools are often the strongest buildings in the village, and the centre of the community. Some of them look a bit run down but they’re still fairly solid structures. We spend a lot of time discussing with communities what the greatest needs are before we do anything, so we always get very warm welcome because they know we’re trying to help. 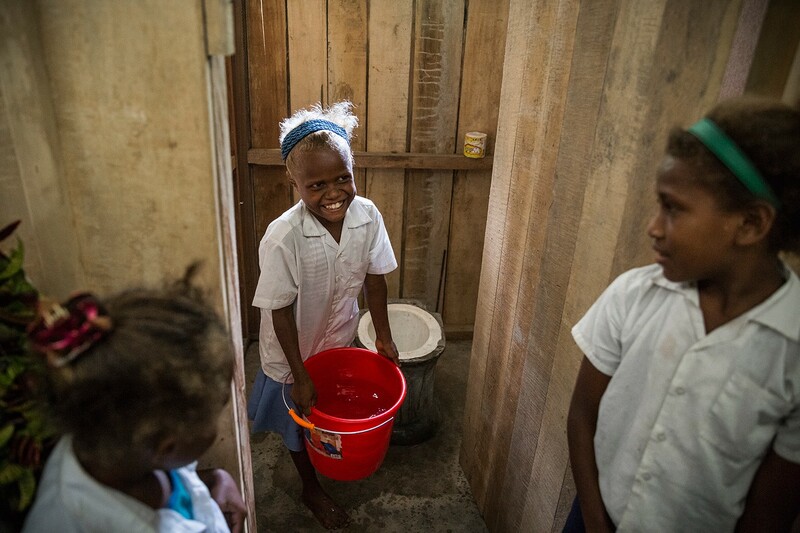 Vanka, 9, shows how she flushes the new toilet that was built in Sali Primary School on Guadalcanal. Providing water and sanitation is especially important for girls reaching puberty. If there aren’t good toilet facilities, girls will definitely stay at home if it’s that time of the month. The more they stay away, the lower the quality of education they receive, and the lower the level of outcomes for that girl. Good water and sanitation increases attendance for girls, especially early teenage girls. If there aren’t good toilet facilities, girls will definitely stay at home if it’s that time of the month. The more we can do to reduce absenteeism rates and encourage girls to stay in school, the better the outcomes for those girls. 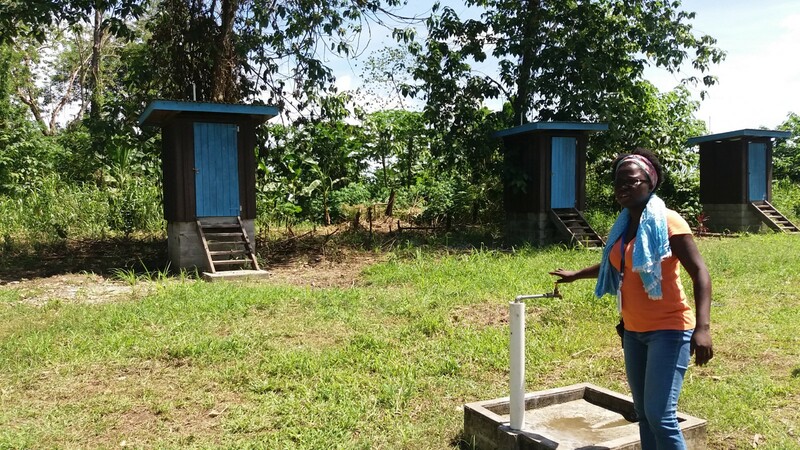 Examples of the new toilet blocks being provided to 42 schools on Guadalcanal. For me, seeing communities making those changes for their children is what makes it all worthwhile. There was one school where we’d had a workshop with the teachers,showing them the basics of our hand-washing programme. When we visited that school two weeks later, every single classroom had a hand-washing station with tippy-taps — little bottles of water you can tip up and wash your hands with. And at the end of it was a multi-student hand-washing system — it was quite an elaborate design, with one tank on the roof, which led to a horizontal pipe. They’d put 20–30 holes all the way down the pipe so when you turn the tap on little sprays of water would come out of these holes, and 20–30 children could wash their hands at the same time. The school was so proud. The head teacher told me she wanted the best education outcomes for her pupils, and the workshop made her see the connection between access to safe drinking water, toilets, good hygiene, and absenteeism rates. That’s exactly what we’re looking for, schools increasing awareness of the importance of hand-washing, which they now have, and then they go off and build their hand-washing station — that’s the perfect outcome for us. Some of the students at Sali Primary School in Guadalcanal. 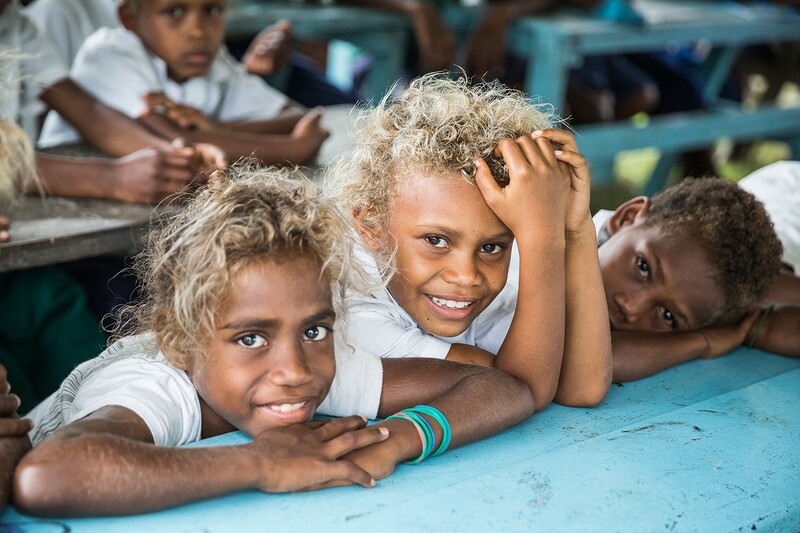 To find out more about UNICEF’s work throughout the Pacific, click here.